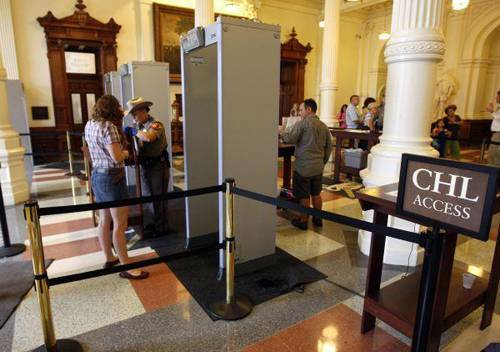 After the attack in the Texas Capitol earlier this year, the Texas Legislature passed new security measures to defend people who visit and work in our beautiful capitol building. These measure include a metal detector to prevent unauthorized weapons from being carried. People with a Concealed Handgun License (CHL) had previously been allowed to carry in the capitol building. This did not change with the new metal detectors. What did change is, people with a CHL are now allowed to bypass the metal detectors by showing their CHL and having is scanned to make certain it is still valid. The unintended consequence of this has been a perceived rush by staffers and lobbyists to obtain a CHL in order to bypass the lines of tourists waiting to get into the building. The Texas Legislature recognized the fact that government has nothing to fear from law abiding citizens being allowed to carry a weapon in their presence. I think this makes the Capitol just a little bit safer and I am very happy I will be able to bypass the security line when I visit the next Legislature. What do you think?